Ocean worlds within our solar system and beyond have emerged as compelling possibilities for habitability and life on the basis of the scientific discoveries of the Galileo (at Jupiter) and Cassini (at Saturn) missions, as well as the potential for records of substantial water at “ocean scales” in the past histories of Mars, Venus, and possibly Ceres. Understanding the context for oceans today that exist beneath protective shells within the outer solar system at Europa, Enceladus, and potentially other worlds, has raised tantalizing questions about the existence – or at least preserved records – of life beyond Earth. While we search for records of past life in the rock record on Mars and await robotic return of samples, plans have been in development for missions to the most accessible ocean worlds in our Solar system, with initial emphasis on Europa. Today, evidence supports the existence of a massive sub-surface ocean on Europa, likely larger in volume that that of Earth’s present-day oceans, with potential avenues for exchange of these oceanic waters with the dynamic outer surface of this Moon-sized world. The Europa Clipper multi-flyby mission that NASA is planning for the 2020’s will explore the habitability of this exotic ocean world, setting the course for follow-on surface missions that could focus on an in situ search for signs of life in the context of the geologic environments on Europa. 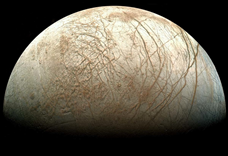 A recent science definition team study released in February, 2017 by NASA investigated in detail the scientific questions that could be uniquely addressed with a landed Europa laboratory, and outlined specific investigations that would be most fruitful in the search for life there. Advances in the detection of life at its limits here on Earth as well as demonstration of new measurement systems on Mars, such as the “SAM” instrument on the Curiosity rover, have dramatically improved prospects that the conceptualized Europa Lander mission could discover remarkable clues about how life may or may not have operated on a present-day ocean world. Beyond Europa there are other potential modern ocean world targets for future missions, such as Enceladus and Titan, as well as prospects that next-generation space observatories could detect signs of surface oceans on nearby exo-planets, perhaps as soon as the 2030s. These possibilities represent a scientific revolution in the making and connect Earth and our oceans to these new worlds, as well as to planets that may have had a former oceanic “state” and lost their oceans. NASA and partners are poised to explore these pathways in the next twenty years and alter the paradigms that have been in place for decades. James B. Garvin is the Chief Scientist at NASA Goddard Space Flight Center, and is co-chair for the Europa Lander Science Definition Team. He has been with NASA for 32 years and previously served three Presidents as NASA Chief Scientist. In addition to providing strategic analysis and advice to NASA’s senior leadership, Jim also served as chief scientist for Mars exploration, spearheading the development of a coherent exploration strategy and its realization in missions like the Mars Exploration Rovers, the Mars Reconnaissance Orbiter, the Phoenix polar lander, and the Mars Science Laboratory, Curiosity. Jim served as NASA’s Project Scientist for the Earth System Science Pathfinder program during the first five years of its existence during which GRACE and Calipso/Cloudsat were selected and implemented. In addition, he was the one science member of Sally Ride’s post-Challenger team, chaired the 1999-2001 NASA Decadal Planning Team for Human Exploration, and served as Program Scientist on the requirements definition team for the Lunar Reconnaissance Orbiter mission. He also served as a Co-Investigator on the Mars Observer, Mars Global Surveyor, NEAR-Shoemaker, Radarsat 1& 2, Mars Curiosity Rover, OSIRIS-REx, and ENVISAT missions. Jim has an unusually wide range of scientific expertise and experience in Earth and Planetary Sciences. His scientific expertise includes, but is not limited to, the geomorphology of oceanic islands, the geology and geophysics of impact craters, and the geometric properties of sedimentary systems on Mars, Venus, and the Moon. He was a founder of Mars Orbiter Laser Altimeter (MOLA) experiment and led the use of MOLA topographic data to investigate impact cratering on Mars. He served as chief scientist on the two flights of the Shuttle Laser Altimeter experiment that made the first measurements of tree heights from space. He is co-investigator on the Canadian Space Agency’s RADARSAT missions, and helped use images from this mission to document the 1996 outburst flood in Iceland, as well as landscape dynamics on newly-formed oceanic islands. He has participated in expeditions to a variety of terrestrial impact sites including the Zhamanshin impact crater in Kazakhstan, and he has led more than a dozen aircraft laser remote sensing campaigns in Iceland, Azores, Meteor Crater in Arizona, Mt. St. Helens, Mt. Rainier and islands in the Caribbean, among others. He recently led a team of scientists in utilizing the Hubble Space Telescope to explore the lunar surface at ultraviolet wavelengths in search of potential resources to support human exploration of the Moon. Among many other awards, Jim is the recipient of two NASA Outstanding Leadership Medals for work on the Mars Exploration Program, and two Presidential Rank Awards for his contributions to NASA science. He also received the William Rogers award given by Brown University for noteworthy contributions to science by alumni. In addition to his work with NASA, he serves on the Board of Advisors of the Institute for Environment and Society of Brown University. Jim has published over 90 technical papers and popular articles on space exploration and Earth sciences. He has made numerous presentations to scientific and lay audiences, and he has appeared frequently on television speaking on space exploration, including appearances on “Late Night with David Letterman” and on the Discovery Channel’s “Alien Planet”. Jim earned a BS from Brown University, an MS in Computer Sciences from Stanford University, an MS in Planetary Geology from Brown University, and a PhD in Geological Sciences, also from Brown. Jim was “hooked on space at birth,” according to his family, and he has been collecting rocks and space-related information ever since. He looks forward to wandering the Icelandic wilderness someday searching for pieces of Mars on Earth. Dr. Garvin began by noting the 30th anniversary of NASA’s Voyager mission to the edge of our solar system. He then moved to discussing a nearby ocean world bigger than our own. Europa, the Jovian moon first examined by the Voyager spacecraft, has a land area approximately the size of Africa. Scientists believe this moon has an ocean that is volumetrically the size of our own here on Earth. Also like Earth, we have reason to believe this “cueball planet” is a dynamic world, with a crust that deforms 100 feet per orbit, due to its ocean. Unlike Earth, Europa lies in the radiation belts of Jupiter, which is not conducive to long-chain organic molecules that all humans are made of. Garvin said the best working hypothesis for life on Europa is a large, 100-kilometer-deep ocean, covered by a crust of silicate ice several miles deep, shielding ocean life from radiation. This hypothesis is supported by reconnaissance from the Voyager and Galileo spacecraft. To be sure whether there is life on Europa, according to Garvin, we must go there. Garvin likened the vision for going to Europa to NASA’s exploration of Mars. NASA sent the Viking spacecraft to Mars in 1976, to read the chemistry of the environment. NASA subsequently sent a gas-chromatograph mass spectrometer, landing a lab on Mars in 2012. In the years since landing on Mars, NASA has discovered organics, a methane cycle, and chlorobenzenes – but not the life signs scientists were hoping for. For Mars, “the fun stuff” is all in the past. Ocean worlds, however, present better prospects for finding life that is still present. Europa is home to the most accessible foreign ocean in the Solar System, with liquid close to the surface and potential fissures in its ice crust. “The exciting stuff,” Garvin said, would be seeping or bursting through Europa’s crust. But, it has a short resonance time because of Europa’s intense surface radiation. Today, NASA can land on Mars within 10 kilometers of the target, which Garvin calls exceptional. But the good stuff on Europa may be located within an area of only a kilometer. If NASA is going to land a static lab on Europa to conduct in situ analysis, NASA needs to improve its landing accuracy. So, Garvin proposes to leverage the James Webb Space Telescope’s spectral power to examine the chemistries of small surface areas to identify potentially fruitful surface areas. Then, the CLIPPER mission will follow, in the early 2020s, for habitability reconnaissance. 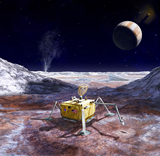 CLIPPER will provide the requisite resolution to understand Europa’s terrain and paint a picture of the surface in sufficient detail to accurately land a laboratory. After figuring out where to land, Garvin thinks a landing mission to Europa in the early 2030s would be possible. To make that mission a reality, NASA will need to balance the quantity and quality of the answers it wants, with the cost of obtaining them. The intense radiation on the surface of Europa limits the lifespan of any instrument, and mobility increases the cost. The current plan for a Europa lander is a static lander. Because the lander will not be able to move, it will have cricket-like stabilizers, rather than firm legs. As such, the lander is affectionately called, “The Cricket.” The Cricket’s body is a vault, protecting its sensitive instruments, capable of processing up to five samples to answer a series of research questions. Garvin expects that analyzing the first data from the first lander will lead to additional research questions and inspire future missions. Already, there is discussion of sending a walking rover, a sample return mission, and missions using soft robots. Garvin views the Europa mission as the first of many ocean world explorations. Potential future missions could take us to Saturn’s moon Enceladus, or even to Pluto. Garvin concluded by saying that exploring for life in our own solar system will teach us how to look for life in other star systems. NASA is beginning to develop tools for this that can detect spectral signatures suggesting atmospheres capable of supporting life on worlds around other stars. One questioner asked where is the best place to land Europa. Garvin responded that a prime target would be around a fresh vent spewing organics. Another questioner asked why the Europa lander was not nuclear-powered, possibly saving money. Garvin responded that the expected life time in that environment is too short to justify the additional weight for nuclear power. After the question and answer period, President Millstein thanked the speaker, made the usual housekeeping announcements, and invited guests to join the Society. At 9:47 p.m., President Millstein adjourned the 2,380th meeting of the Society to the social hour.